Since 1999, JTS has been using its resources to dispatch relief teams to deliver assistance to those who were struck by disasters, natual or man made. With growing concerns of increasing frequency and strength of natural disasters attributed to climate changes, 2006 was a year that demonstrated that recovery efforts following disasters always require a prudent coordination between the international agencies, local government and local groups such as schools, civil societies as well as the victims themselves. 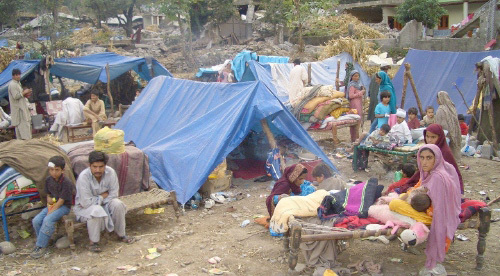 Natual calamities tend to strike the most vulnerable group of people in impoverished regions of the world. However, acknowledging the criticisms given to the relief agencies who run the risk of demolishing the local intiative and capacity to help themselves, we alway work with the victims of disasters in our intervention to bring their livelihood back to normal. In addition to working with local groups, we recruit local volunteers and cooperate with local religious groups and university to tacke the task of reclaiming the lives of the disaster victims. Moreover, adhering to the internationally accepted disaster response standards such as the Sphere Project, all of our relief supplies are purchased locally.